The whole SLI team did a great job. Thank you so much for all of the hard work. I will recommend your company to all of my friends. 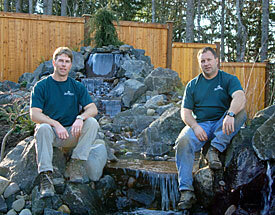 Our thanks to Darren and the entire crew for the thought and preparation in our landscape design and installation. They fulfilled all of our desires and needs in the landscape and the plant selection is unique and varied. 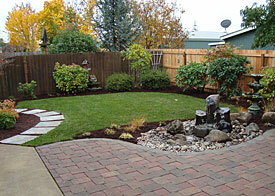 We believe our landscape will age well over time. Thank you and your crew for all of your hard work. It looks so nice! you do great work, what a fun job to go around making the world a more beautiful place. Every time I look at my new yard I'll remember there are good people in the work force who do go the extra mile. The sprinkler system is working great. Thank you for your timely response - it saved my lawn! Thank you for the great design and attention to detail. The entire yard is beautiful and a joy to be in! Thank you for the terrific job. We love all of our trees. Living in the Southwest Eugene hills is very dark at night without street lights. With the addition of the LED path lights and up lights it is much safer and enjoyable in the evening. The investment of the LED lights was well worth the cost as the monthly electric bill did not change. Thanks for doing a great job. The finished product truly makes our home a special place. 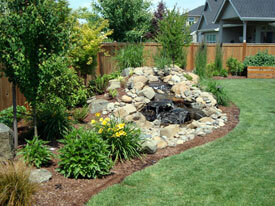 A special thanks for suggesting the pond, as it certainly makes our back yard come alive. Keep having fun! Many thanks to you and your entire team for creating a great yard for our family. We really appreciate your attention to detail as well as your personal oversight and involvement throughout the project. I know that our yard had particular challenges and I appreciate the time you took to listen to what we wanted to accomplish and to help us determine what would work best for our yard, our lifestyle, and our style. I really love the back patio and the focus and inventiveness that your crew used to create it. We know this was a big job and we are grateful that you went the extra mile. We look forward to the next phase of adding lights and other additional touches.